Our trip to New York on September 28th-29th is shaping up nicely (the itinerary is on the blog in case you need to refresh your memory). So many artists are keen to welcome us, it's tough to make a selection. First there is Mark Davis. Mark is a phenomenal artist who works vintage bakelite salvaged from old radio clocks, bag handles, door knobs... into fine jewerly pieces. He has developped a complex process of reshaping the material and inserting precious stones and gold inlay. It's got colour galore, it's happiness jewelry. If you like art deco inspired pieces, he is your man. His studio is in an old rope factory built in the 1850s' and still has the old cage style freight elevator. It overlooks the water and the city. It's just magical. Katrin Zimmerman welcomes us in her brownstone house in Harlem for cocktails on Friday evening - she has been living in Harlem for over 25 years and will share many stories about the area - can you imagine Harlem 25 years ago? Her jewelry is the stuff of bodlness and happiness. Lots of colors, movements and contemporary vibes. 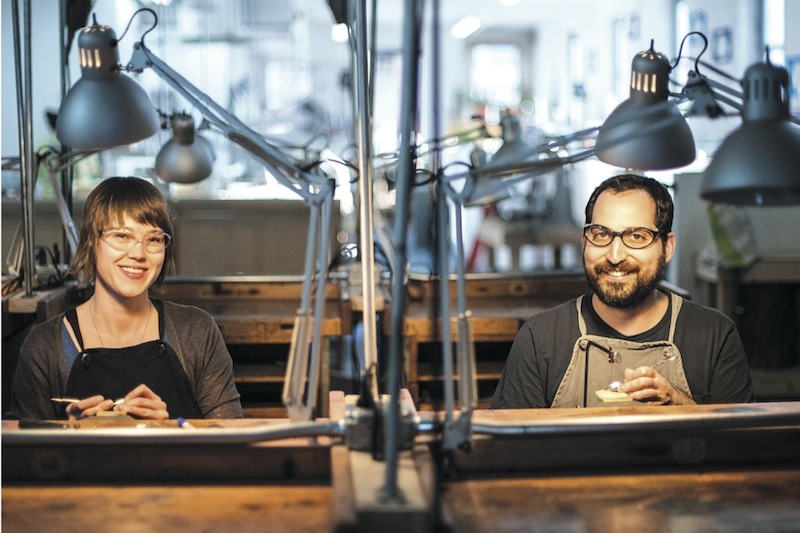 Brooklyn Metalworks is the wonderful studio collective and art gallery space of Brian Weissman and Erin Daily. It is a hive of jewelry talents - artists can rent the space and tools, students come for classes and clients for treats. More than 20 artists are present which will give us a fantastic overview of many artistic approaches and styles. I love listening to the artists stories and creating a relationship with them - so much more enjoyable than buying off the shelf. 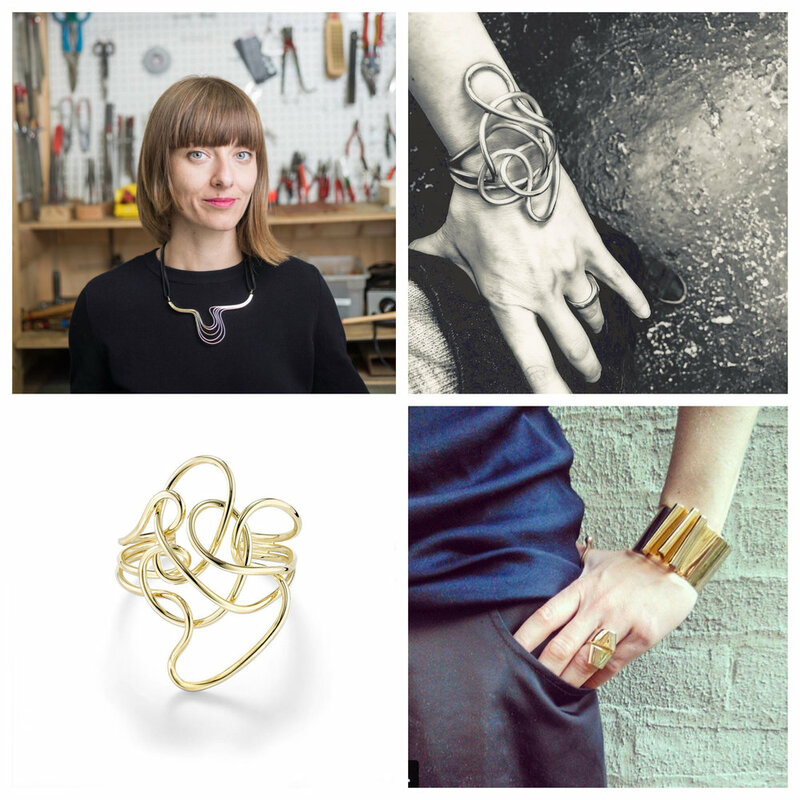 One of my favourite artists at Brooklyn Metalworks is Mia Hebib, the founder of Oblik Atelier. Bosnian born and Croatian raised, she is a graduate of the (exceptional and very cool) Savannah College of Art and Design. Her style is all about lines and art - she is a metal-smither. Sometimes with art jewelry, the brainy part of the making process makes it aesthetically less accessible to us diletante. But with Mia, she knows how to tease our brain and get our "Iwantitometer" to work together - it's just great. One of my friends commented this week "jewelry, it's really the stuff of relationships." I liked that idea, that when you join the trips you (my guests) will forge new relationships with the artists, other guests, new places. It's a neat idea don't you think? Please share this post with your friends and network, let me know where you want me to take you next and anything else you want to share - I can't do it without you!